IRVINE, Calif., Feb. 2, 2011 – For the first time since the inception of the California Motorcyclist Safety Program (CMSP), the California Highway Patrol (CHP) has awarded 24 MSF RiderCoaches with Certificates of Commendation for Exceptional Performance. Selected recipients were honored at the Annual CMSP Workshop series from over 500 RiderCoaches throughout the state based on MSF RiderCourse student satisfaction survey results. After compiling data from a voluntary survey provided upon course completion, CHP CMSP Coordinator Shameil Coleman presented the RiderCoaches with awards at workshops in Sacramento, San Jose, San Diego and Valencia. RiderCoaches were commended for their professionalism and unwavering commitment to motorcycle safety. CMSP Quality Assurance Manager David Crouch received a special commendation for his strong leadership of the CMSP Quality Assurance team since 2007. Crouch’s commitment to consistently deliver the MSF curriculum at an optimum level throughout California, as well as his dedication to the RiderCoach Preparation training program, have contributed to the CMSP’s reliability and stability, read the commendation. The MSF is a not-for-profit organization sponsored by BMW, BRP, Ducati, Harley-Davidson, Honda, Kawasaki, KTM, Piaggio, Suzuki, Triumph, Victory and Yamaha. 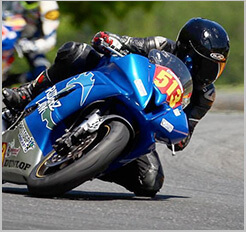 For safety information or to enroll in the RiderCourseSM nearest you, visit www.msf-usa.org or call (800) 446-9227.